Join our Kayak Guide School and become an ACA Certified Whitewater Kayak Instructor (WKI) on the Rio Futaleufu in Patagonia, Chile. a] Prevention: Knowledge of river hazards and safety & personal safety. Ability to assertively manage a group when necessary and alertness for the well being of others is critical. b] Presentation: Ability to communicate safety concerns to the group and apply them on water. Instructors must consistently model and practice safe paddling and group leadership at their level of certification. ACA Instructor Candidates require the general technical knowledge on equipment, conditioning, paddling theory, river reading, river running strategies and rescue. ACA Instructor Candidates should be thoroughly familiar with basic river running maneuvers including eddy turns, peel outs, ferries, and must be able to handle their own boat competently on a level of water one classification above that on which they will be certified to teach. High-quality boat control in Class III water is mandatory. Candidates must have a reliable river roll that they can demonstrate three times in a row in a combat situation. They must possess good balance, effective strokes, use correct angles, momentum, and have the ability to read water well. In other words, paddling with grace, control, and mental tranquility, not just surviving.
. Modeling should be done in a way that provides students with a clear visual image of the technique being taught without shortcuts. ACA Instructors Candidates should always be modeling good technique to their students. ACA Instructor Candidates will demonstrate the ability to explain, in layman's terms, the mechanics of stroke efficiency, maneuvers, and safety concerns. Teaching skills include: logistics, lesson organization, class control, teaching of specific technical topics, technique analysis, and demonstration of leadership skills and judgment. Evaluation of teaching and class interactions throughout the week. Proficiency test on Class III whitewater. ACA Instructor Candidates are required to present two and five minute “teaching topics”directed toward beginning students. Evaluation centers on the quality of content, class interaction, and degree of prioritization. Successful candidates must be able to employ a variety of teaching methods. A quality presentation keeps the attention of the audience, organizes information in a logical way, and gives a level of detail appropriate to the level of students being taught. A successful teacher conveys enthusiasm for the sport and an ability to connect with students. Certifying an individual as an ACA Kayak Instructor, in the final analysis, is up to the ACA Instructor Trainer. The trainer has to rely on his or her experience and careful observation before granting an instructor certificate. Candidates attending this week of instructor training should not be expecting a certification for showing up to the class. 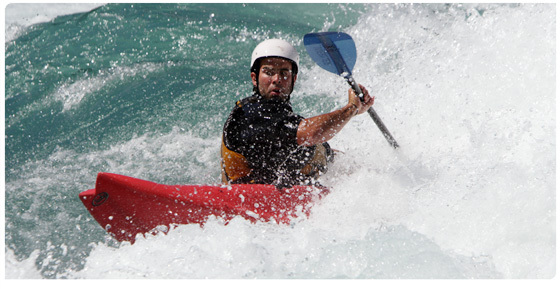 Candidates who do not meet the criteria for whitewater may be certified in moving water or flat-water at the discretion of the instructor trainer. In addtion to the ACA Kayak Instructor Certification Program a Class 5 Elite Instructor/ Guide Endorsement can be earned. You will be evaluated by Chris Spelius on the most difficult sections of the Futaleufu River. We will present intensive advanced workshops on rolling, safety for Class V paddlers, guiding Class V groups, and Class V boat control. Modeling of the following rolls: Sweep, C-to-C, Back Deck, Back Deck Rodeo, and some understanding of hybrid rolls. You will be required to demonstrate teaching sequences for 4 of these rolls. Simulated rescue underneath the Mundaca rapid on the Futaleufu river. Safety rescue techniques demonstrated in bringing in a kayaker and boat without problems. The Elite Instructor / Guide Candidate will demonstrate river skills by successfully descending 3 of the 5 Class 5 rapids. Casa de Piedra, Terminator, and the Infierno canyon. Safely leading a group of our instructors through the Class V Casa de Piedra. A certificate and a letter of recommendation from Chris Spelius will be given to all candidates that successfully complete the advanced workshops and examination. Passing candidates are welcome to apply for a kayak guide position with Expediciones Chile for the following season. If you are interested in this option please call the Expediciones Chile office. Over the next three days we will go over all the essential skills needed to pass the ACA Instructors Examination Course. Instruction will take place primarily on the Rio Espolon (Class II/III) and El Macal Section of the Futaleufu. 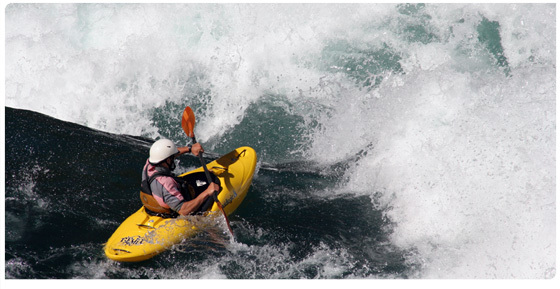 The kayaking this day is filled with the big exploding waves for which the Futaleufu is world famous. We put-in at the "Zapata's" swinging bridge and run the ""Corazón", – the Heart of the Futaleufu - previously named "The Continuous Section". 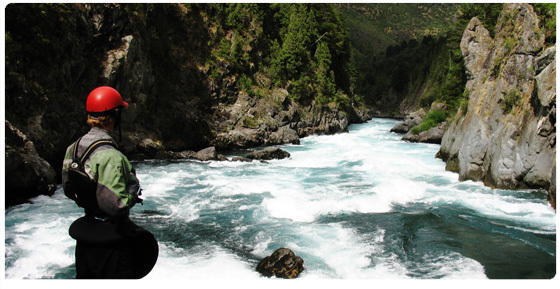 Here you will kayak Futaleufu whitewater continuously through Class IV big water action, including ""Entrada", ""Pillow", and ""Mundaca" , one of the largest breaking wave-holes in the world. This is Futaleufu kayaking at its best! This non-stop Class IV section will keep your adrenaline pumping and the evening air filled with good cheer and plenty of fireside stories. Wake up for an early breakfast and drive back to Chaiten, Chile and your flight to Puerto Montt, or relax for a couple of hours and take our shuttle to Esquel, Argentina. As you catch a final view of the Río Futaleufu; surrounded by hanging glaciers and snow capped mountains, take a moment to reflect upon all of the amazing sights and experiences of this past week. After all these years we are still stunned that views like these exist.